But when the cameras went away and the hype died down, people kept showing up. Council meetings used to have paltry attendance at best, but every council meeting since has had a large crowd. A community group, Women of West St. Paul, formed out of that initial flurry of activity. They organized a candidate forum for the four-way city council race, and once again the city council chambers were packed and more than 600 people watched the video live (a higher-quality, multi-camera video of the forum has also been posted to YouTube). All for a candidate forum with only one candidate. Initially two candidates said they would attend—but Wendy Berry had a death in the family and couldn’t make it—and two other candidates, David Meisinger and John Ramsay, didn’t attend, leaving Lisa Eng-Sarne as the sole candidate to answer questions and share her vision with the packed audience. Berry had a statement read at the event in her absence, and later answered the questions on Facebook Live. Since that candidate forum, more than 2,800 people have watched the original video, and even Berry’s week-later solo video has earned 2,300 views (as of this writing). All for a city council race that saw 930 total votes in the 2016 primary, with a total of 4,076 registered voters in ward 3. My neighbors in West St. Paul are hungry for information about the candidates. Which makes it especially bizarre that Meisinger and Ramsay not only skipped the candidate forum, but have been reluctant to answer questions and engage with the public. Meisinger, a former mayor in West St. Paul, removed his campaign page in July and, as of this writing, Ramsay has only posted to his Facebook page twice. I’ve already written about David Meisinger’s inappropriate behavior in recent months. It’s a bizarre backdrop to a race that’s otherwise engaging and exciting for neighbors. Thankfully two of the candidates, Wendy Berry and Lisa Eng-Sarne, are engaged. They’ve been showing up and talking to neighbors. They listen and ask questions. They respond. It’s what the political process should be. This is what democracy looks like. 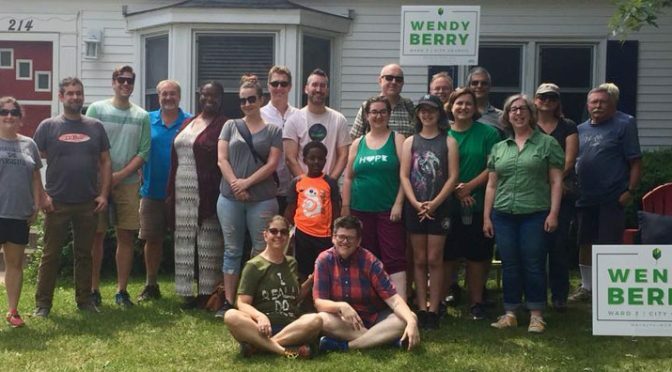 I’ve already shared why I’m voting for Wendy Berry. I like that she’s engaging the community and trying to bring more people to the table. Clearly West St. Paul wants more of that. This primary is a big deal. It’s a moment of truth for West St. Paul. Do we want a path that alternates between intimidation and outright silence, or do we want a path of welcome and engagement? It seems like an obvious choice for local government. It’s a four-way race and the top two advance to November’s general ballot (but you can only vote for one! ), so anything could happen. We may have to repeat this exercise in November—that’s why it’s so important to get out and vote. I’ve been inspired by DFL-endorsed candidate for governor, Erin Murphy, and her #PoliticsOfJoy hashtag. I don’t enjoy talking about the negatives in a race, but sometimes it’s necessary to recognize and call out inappropriate behavior. But that’s why I started this blog post with the energy I’m seeing from West St. Paul residents. I don’t want to be all touchy-feely, but I hope that positive energy drowns out the negative on August 14. I want to celebrate a #PoliticsOfJoy in West St. Paul. I’m hopeful that after the primary we can have an election of ideas where West St. Paul candidates truly engage with residents. The primary is Tuesday, August 14—and while there are important statewide races on the ballot, my neighbors and I in West St. Paul will be paying close attention to the ward 3 city council race.